A hero with a semi-automatic pistol has the advantage over fully automatic weaponry in any quantity. If I were sent off to war, I'd take a slingshot with me. As long as I'm fighting for the "right" cause, I'm invincible to gunfire, shrapnel, and even small thermonuclear detonations. Meanwhile I could take down hundreds of nameless and faceless evil minions with one shot. Even on the off chance that I'm shot/stabbed/bludgened with a blunt object, I could easily continue to fight through the pain and eventually win the war. This is how it always works in the movies. Just to see if it would work in real life, I decided to conduct an experiment. What is the best medium for bringing gunfire and violence into the American home? Video Games. 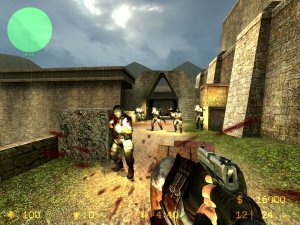 I fired up Counter Strike: Source and tried the following scenario: Me with my trusty Heckler & Koch .45 USP Tactical pistol (trust me, it's a lot less badass than it sounds) vs. 15 bot players on easy mode with $16,000 and only able to purchase sub or full machine guns. The following pictures should be a pretty good indication of what exactly happened. 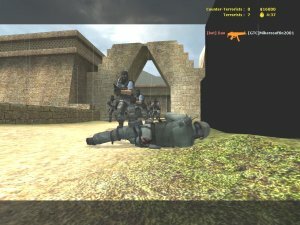 Needless to say, I died almost instantly even though I was a counter-terrorist. I was a good guy! Oh well, I guess it just doesn't work out that way in real life. Every James Bond Ever Well, when the World is Not Enough for you to get a License to Kill it might just be time to Live and Let Die. You can just tell The Man With the Golden Gun to Goldfinger himself. That should scare The Living Daylights out of him! Remember, You Only Live Twice, so you should Die Another Day, but not tomorrow, because Tomorrow Never Dies. Behind Enemy Lines After seeing Owen Wilson in movies such as The Royal Tenenbaums, I never thought he was capable of playing the part of a hard-core fighter pilot who must fight to stay alive in enemy territory. Turns out he isn't.